This year has been a year of firsts and it's not even over yet...! Nearly as many firsts in this year as there could have been the year I was born - maybe more, newborns don't really do THAT much apart from sleep, eat and defecate do they?? In fact, lets face it, my life has completely changed since this time last year. October of last year I had recently become engaged, I was living at home with my parents in a quiet village a few miles from town, I drove 40 miles a day to work, I drove 240 miles twice a month (give or take) to see my husband-to-be, people who I have known my entire life were right on my doorstep. This October, I am married, living with my husband in a terrace, a few seconds from the centre of town, driving 0.8 miles to work everyday, driving 240 miles home to see parents and parents in law at different ends of the country and apart from my husband, I began my life here in July knowing only one person who was within 20 minutes of me, should I need rescuing. Incase you are wondering why the home location is so specific - moving from a house that was very private with nothing but sheep and cows to military housing in a terrace with a very open back garden and lots of people is a very big deal, and not one that I had pre-empted at all! Those are the big firsts, the ones I worried about and lost sleep over but have all worked out amazingly... The smaller ones seem to make me realise how special it is to still be able to have 'first times' and the 'magic' that is associated with being a child never really has to stop. It seems to be less about being a child and more about trying new things. 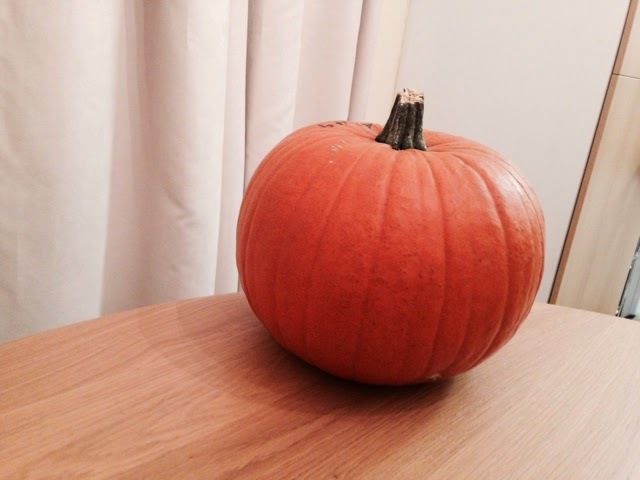 Today, Tom bought me my first ever pumpkin to decorate for Halloween - my family never really did Halloween and the one year we did have pumpkins I was definitely too small to do any carving of it myself. Lets hope I don't mess this up in my excitement! !